Last night at Station Park Forfar, the Accies under 19 team lifted the SFL under 19 league cup beating a Forfar team 5 – 2. What with the attraction of free entry, a visit to one of my favourite grounds and hopefully to see Accies win a trophy, I went along. 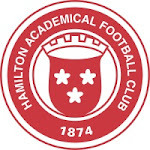 On paper Hamilton were favourites to win with many of the players part of the under 20’s team that has done so well in the SPL under 20’s league. However Forfar in getting to the first national cup final of any kind in the club’s 128 year history were not there just to make up the numbers. In the semi final, 2 down to Livingston with 5 minutes to go, they managed to score twice taking the game to extra time and then put another 3 past the Livvie goalkeeper winning 5 – 2. One of the great attractions of Forfar’s ground is its traditional terracing set up that allows you mingle with those round you. Before the game I chatted to one of their directors discussing their artificial pitch which has made a huge difference to the club. Next up in ground development, the club are hoping to replace all the stand side floodlights with two new floodlight columns in the corners. No doubt the two visits of Rangers next season will help pay for that. There were a few Accies fans in the stand, mostly family of the players but I seemed to be the only Accies fan on the terracing and the banter with the Forfar fans was good. Anyway to the game itself there is a perfectly good report on the Club website but Accies were clearly up for it from kick off and by the 29th minute were 3 up through Brophy and Ryan (2). Forfar scored the goal of the half straight from the restart at 30 minutes but Brophy scoring in 37 minutes restored Accies’ 3 goal lead. The Forfar fans around me acknowledged that throughout the half, Accies were far quicker getting to and on the ball perhaps a reflection of their experience and fitness. The second half kicked off with Forfar quickly adding a second in 47 minutes and for a spell this obviously geed them up but Accies took control adding a fifth in 83 minutes and the rest of the game was goal less. The final whistle saw the presentation table brought out and the SFL Director of Operations David Thomson was on hand to present medals, first to the runners up, referees and then the Accies players before handing over the Cup to captain Lee Kilday. So at the end of an eventful season Alex Neil not only has had a successful spell as Interim manager in the league but his under 19 team lifted silverware. Good to see Ronnie, Les and Scott amongst the officials present and given Forfar usually manage about 450+ for home games, the 300+ crowd was a healthy turnout. I’ve used the crowd figure from the Forfar website which was more realistic from my viewpoint than the Accies quoted figure. Now when is the first game of the new season? Cadzow Accies, who currently play in the Scottish Supporters Football League, have been running for 22 years and have never reached a Cup Final. Having beaten St Mirrenoff in the quarter final and Kerrydale Celtic in the semi final we now face Sandbank Rangers, the current cup holders in one of our biggest games in 22 years. Manager Ewan McGregor has a full squad to choose from and will have a selection headache on the back of Cadzow’s last two games, a 2-1 win at home to Clyde, and a convincing 3-1 victory over Falkirk. Kick off is at 6pm on Sunday the 19th of May at Broadwood Stadium, (Clydes ground - at the moment!). All are welcome, entry is free and there should be a pie stall open for refreshments throughout the game. Afterwards, everyone is welcome back to the Manhattan Bar in Hamilton for what we hope will be post match refreshments and celebrations. On another note about this, Les Gray, Chairman at Hamilton has kindly let Cadzow borrow the first team home kit to wear. On behalf of Cadzow I would like to thank him for this kind gesture as it will mean we get to run out in the red and white hoops for the biggest game in Cadzow's history. Wigan Athletic's shock win in tonight's FA Cup Final is especially sweet for the ex-Accies contingent, notably James McArthur and James McCarthy, but also Assistant Manager Graeme Jones. 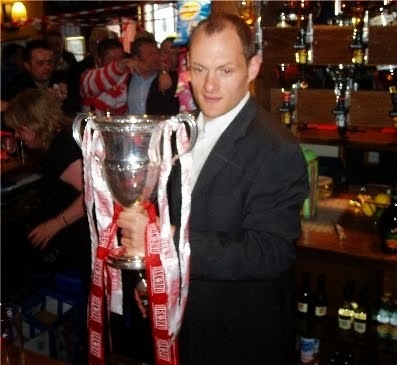 One of the Accies Blog team, Ian Kelly, was at Wembley to see it happen. Speculation elsewhere that qualification for Europe triggers add-on payments to Accies for the James boys. Regardless, it's quite an achievement for the former hoops heroes, and one we can all take pride in. On ITV, they said it was an Irn Bru celebration - it was certainly one at least partly made in Hamilton. This story certainly made me laugh! Following today's surprise announcement of Sir Alex Ferguson's retirement, it appears Manchester United are about to appoint Davie Moyes as their new manager. Talksport and the Daily Telegraph are among the media claiming the appointment has already been made. Moyes made five appearances as a defender for Accies during season 1993-94. It looks as though our season ticket for next year is going to be £200 with kids under 12 getting in free if accompanying an adult. A £50 pound increase is a very significant rise for what was the cheapest season in the league but looking at other SFL1 clubs prices for next season where they have been announced, its still a comparatively good deal. Where next season’s prices haven’t been announced I have used last season as a comparator (*). Some clubs do have an early bird price, i.e. if bought before a certain date then a bit cheaper. I have also excluded Dundee and obviously we don't know who is going to win the play off. For obvious commercial reasons Accies don't disclose the number of season tickets holders. I assume however they have done the maths and think they will hold onto most of this seasons holders, but I’m not sure we should expect a significant increase for next. Season tickets are just part of revenue generation. It’s about time Accies took a real hard look at all commercial activities and undertook a root and branch transformation. It’s all very well concentrating on our youth academy but an efficient and effective commercial structure is vital when the attendance money from fans is no longer the primary source of revenue. Around 140 Accies fans (by my quick count) attended the Fans Forum at NDP following the disappointing loss to Cowdenbeath yesterday. The mood was positive, despite the result, and supportive towards the club. The platform consisted of Allan Maitland and Les Gray, joined after the dressing room post mortem by Alex Neil and Frankie McAvoy. Contrary to some expectations, the forum was not dominated by the issue of league restructuring. Les stated his intention to get it out of the way quickly, in order to concentrate on club matters, and it was covered within the first five minutes. Les stressed that Accies and the other signatories had not resigned from the SFL, and that they had not invited Rangers to join their group. Les explained that the proposals would have meant increased income to Accies in excess of £200,000, with all the benefits that would bring, but that failing to secure this extra income would not destabilise the club. There were no questions of note on this subject. Les explained that we are one year into his three year plan aimed at taking the club back to the SPL, and he still sees that aim as achievable. One illustration of this is the club's wish to instal an artificial surface again, but this has been put to the SPL, and will not happen without their confirmation that it can be used in the SPL (or SPL1). Season ticket prices for 2013/14 have not yet been set, but will be in the region of £200, closer to what other SFL1 clubs charge. The free tickets for children (up to age 12) of season ticket holders will continue. Pay-at-the-gate prices will continue to ensure it is advantageous to buy a season ticket, and will be at least the minimum level set by the league. Les noted that some fans have been telling him that reduced prices would lead to higher attendances, but the evidence of the past season is that, despite rock-bottom prices, attendances actually fell. He stressed the importance of bigger attendances to support our ambition to return to the SPL. Alex Neil has not confirmed that he wants the job of manager on a permanent basis. The question was put to Alex directly, and he explained articulately that the mindset he has as a player (getting wound up in preparation for games) is not easily compatible with the more objective, and supportive of young players, approach required as manager. Alex wants to continue to play, has a year left on his playing contract, and expects to complete a full pre-season's training for the first time in four years. Alex and Les will meet to discuss the situation next week, but the vacancy will also be advertised, to see what sort of interest it attracts. Any appointee will have to concur with the Accies ethos of encouraging young talent, and working within our budget - Les confirmed there will be no "big name" appointment, such as Barry Ferguson or Paul Hartley. Les explained that we will try to bring back Stevie May on loan next season, and discussions are imminent with all of our out-of-contract players. There were also significant contributions from Allan Maitand, director of youth development, and Frankie McAvoy, director of the youth academy, re our continuing efforts to develop young players. There was regret that we had been unable to introduce two or three more to the first team from the bench yesterday, which had been the plan once we went two goals up - a plan derailed by Andy Ryan's sending-off, which ultimately cost us the game. The floor was open and questions of all kinds were welcomed, but there was nothing of much substance, and certainly no hostile questioning. The club's fiercest critics were, as ever, absent or silent. Les emphasised that the club makes every effort to respond to every enquiry, letter or email (with the exception of the rash of correspondence last summer re the Rangers situation), but that it is difficult to answer every anonymous Internet-based complaint. There was more. I left just before the end, and others who were there may wish to add to this report. On Saturday 4th of May we face Cowdenbeath for the 4th and final time this season. Honours have remained obstinately even to date, with an away defeat and draw sandwiching a home victory for Accies. Stevie May has already scored twice against these particular Fifers and his current form suggests he might well add to that total. While Accies have defined their season magnificently in the last month or so, this match remains important in that it could lead to a recently-unthinkable 3rd place finish. Cowdenbeath will be no pushovers, with their own future in the play-off balance. Matters are not in their own hands, in that a Dunfermline victory will secure 1st Div football for the Pars next year. The Blue Brazil need to win at NDP and hope that Dunfermline don't win at home to Airdrie. A cruel outcome could see Cowdenbeath win their 3rd game in 10 but still be ambushed by the likes of Alloa or Brechin in a play-off. Accies will be keen not to show our visitors any on-field hospitality in the knowledge that a victory guarantees a 4th place finish in this most competitive of leagues. Accies have few availability worries (McShane apart) and the starting line up may well be the team that played from the 17th - 89th minutes in last week's fine win at Morton. As well as prospect of a keenly-fought 90 mins on the park, Accies fans have the added incentive of an audience with club Chairman Les Gray immediately after the game. It promises to be an interesting afternoon.